There are many ways to enlarge your child’s world. Love of books is the best of all. Happy School Library Month to school librarians across the country! We have always known librarians and libraries provide vital support to students and teachers in our public schools. But for years school districts have let go of qualified librarians and they have closed school libraries. But there is little research to show that competency-based education (digital learning) or more computer use helps students do well in school. A research study by the Organisation for Economic Co-operation and Development (OECD) in 2015, indicates that students do better with less screen time not more. The report suggests that when it comes to technology “too many false hopes” have been raised. With so little, if any, research to indicate tech is better, why throw out what we know works? Adding to this, a new report explains to us what happens when students lose their librarians and libraries. Without decent library services in their public schools, students go on to have great difficulty in college. They don’t have the necessary research skills to gather good information. They are not able to evaluate the importance of what they read. A report released the other day in the ILA Reporter, “Data Back Up the Headlines: Adding Weight to Advocacy,” by Michelle Guittar and Kelly Grossmann, reviewed the downward spiral of school libraries in the State of Illinois and the Chicago Public School District (CPS). The authors examined the loss of libraries and librarians since 2010 in CPS alone. But this alarming trend can be seen throughout the state. They also tell why parents should be concerned if their students go to schools that don’t have a good school library or a certified librarian or media specialist. Adding concern to this report, it was also just announced that seventeen school districts in Illinois many with low-income students are suing the state for inadequate funding. While the state short-changes schools by cutting programs and staff, they have mandated online school testing. This has meant the purchase of computers and tablets. What proof do we have that this serves students well? Illinois is not an isolated situation. Schools across the country have been cutting their library services for years. How many students have missed out on vital skills that would help them survive in college and future careers? It is wrong to assume just because students can plug in a word on Google, they will be able to distinguish what is meaningful information and what is junk. It is also poor planning to ignore the importance of books to student learning. How will students master college coursework if they don’t understand the rudimentary skills of obtaining and evaluating information? This should not come as a shock to most parents and educators. We’ve known for a long time that schools with good librarians and libraries have students who do better on standardized tests. In 2011, the California School Library Association looked at 2004—2009 test results and determined that children in schools with credentialed librarians did better on standardized reading tests. They determined that students got better reading scores on the National Assessment of Educational Progress (NAEP) with a gain of librarians in school districts. The following year, a Colorado study by the same researchers examined reading performance scores between 2005—2011. 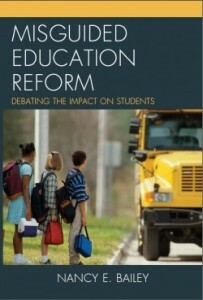 They found that school librarians had a positive impact on student standardized reading scores when students were poor. Yet, knowing this, states and local school districts have continued to eliminate librarian positions. And this has been especially prevalent in poor schools, where library services are essential. Many schools no longer have school libraries. Last year WGBH in Boston reported that “surprisingly” many schools there don’t have functioning school libraries. The problem especially affects young children who are in their formative years and may not learn to value books and reading. This loss extends past Boston across the State of Massachusetts. However, earlier that year it was reported that technology is a priority in that state. Schools were being outfitted with expensive digital devices. Students were to learn to repair the computers in their schools when they broke down. One public school opened with a price tag of $37.5 million, has wireless projectors, white boards, and laptops and iPads in every classroom — including kindergarten. Students have access to media centers with online ebooks more than books. Should we not question state and district administrators who have been so quick to jump on the technology bandwagon, cutting funds to school libraries and getting rid of qualified librarians? They have either not understood or ignored the extreme disservice they impose on students. During this month of library awareness in our schools, school officials and politicians need to recommit resources to hiring credentialed librarians and ensuring that students have access to top notch school libraries that serve their academic needs. Their futures and ours depend on it. Amos, Denisse Smith. “Media Specialists (Librarians) Almost Endangered Species in Duval Schools.” The Florida Times Union. March 31, 2015. Coughian, Sean. “Computers ‘Do Not Improve’ Pupil Results, Says OECD.” BBC News. September 15, 2015. Guittar, Michelle, and Kelly Grossmann. “Data Back Up the Headlines: Adding Weight to Advocacy.” ILA Reporter. April 1, 2017. Lance, Keith Curry, and Linda Hofschire. “Change in School Librarian Staffing Linked 2005—2011.” Library Research Service. January 2012. Lance, Keith Curry, and Linda Hofschire. “Something to Shout About: New Research Shows that More Librarians Means Higher Reading Scores.” School Library Journal. September 1, 2011. Martin, Tina. “A Surprising Number of Boston Public Schools Don’t Have Functioning Libraries.” WGBH News. October 25,2016. Rosenberg, Steven A. “New Mass. Schools Focus on Technology, Security.” The Boston Globe. February 27, 2016. Taketa, Kristen. “School districts Sue Illinois For Failing to Adequately Fund Public Education.” St. Louis Post-Dispatch. April 5, 2017. 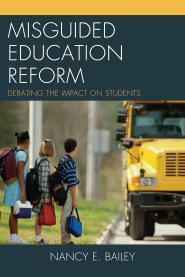 In Misguided Education Reform: Debating the Impact on Students, I have a chapter on the politics of reading. 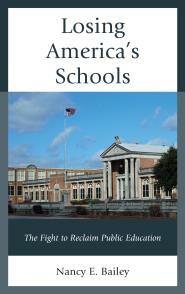 I include a section on our endangered school libraries and treasured librarians. And there’s more!!! For many students, libraries are the only source of books for recreational reading, shown again and again to be the major source of literacy development. Thank you for adding that important point, Stephen Krashen. Current results of an ongoing survey among school librarians indicate that 61% spend less than one hour per day guiding students with book selections. Does this number reflect actual student demand for guidance or is it the result of librarians time being consumed by mandated tasks? Is burden shifting by administrators crowding out this most essential function of a good librarian? My goal is to see computers augment a librarian in their vital role of matching students with good books. Assessing the particular interests of the student could easily be handled by artificial intelligence, leaving the librarian to do the fine tuning computers are less capable of. Thank you for your comment, Mitch. Could you provide the link to that survey. I am trying to better reference sources (my own included). While I am sure that outside demands are most likely being placed on school librarians, your suggestion that their role be turned into one where they “fine tune computers” is worrisome. Certainly! The results are from a poll I created in the School Librarians Workshop group on Facebook. Obviously not a statistically rigorous study by any stretch, but sufficiently lopsided to indicate a trend. Please don’t misconstrue my comment to infer that librarians should be rooted out of their positions by a tool. Not at all. Rather, I see the computer being as the food processor is to the chef. It must expand the capabilities of the librarian rather than limiting their necessity. I quite agree with the assessment of your article. I merely wish to point out that there are great benefits to be gained through judicious application of appropriate technology. Thank you, Mitch. That survey sounds like a good idea! Yes, I agree that technology applied correctly is helpful. Thanks for clarifying and sharing. I really don’t see how expensive computers and software is necessary to help librarians figure out the particular interests of students. All they have to do is ask the student what they like and what their interests are..An engaging conversation of a couple of minutes. If tech people had their way, pretty soon we won’t even know how to talk to people face to face. Why don’t we ask librarians in what way technology can help them with their jobs instead of having people who don’t understand what they do try to figure it out? To me this signals another way that neoliberal “reforms” lead to de-professionalization and privatization of public education. Librarians are often on the front lines for children who need extra support. They are often that “one trusted adult” that builds resilience and encourages a lifelong love of learning. Librarians can make learning come alive and can encourage students to find what they need to think for themselves. Very dangerous in this day and age. Thank you for this article. Well said! Thank you, Jon. Hi Nancy, may I repost this wonderful article? Thanks. Yes, of course. Thank you, Joan. Angela, Thank you! So much great great information here! And you’re right that it supports the Chicago/Illinois study. And there are many links to explore about libraries. I very much appreciate your sharing this. I hope others will look at it too and pass it on to those concerned about school libraries and librarians. And it is useful to those outside PA too of course! Thanks for your article. I am a UK primary school librarian and agree with what you say. Computers are valuable tools and part of the whole picture of literacy, reading for pleasure and empowerment and education. School librarians are needed more than ever to steer young people through this maze of information, but our role is undervalued. I advocate our role to the school leadership teams where I work using regular impact evaluation reports on various initiatives, but my success there is not guaranteed in these times of pressurised budgets in UK schools.. Thank you, Lucy! It is always wonderful to hear from those outside the U.S., and the UK seems to do much of what we do here. I assure you your role is more important than the computer. They are merely tools to help support the vital role you play.